Orange and Mint Salad is bright and sunny; and the perfect antidote to boring winter foods. 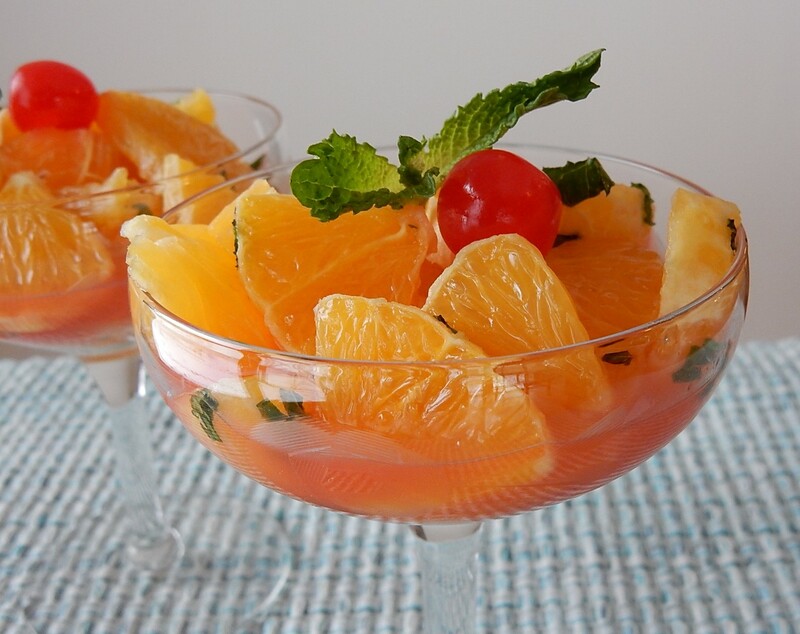 The bite-size chunks of orange are mixed with chopped mint, and then drenched in a delightful citrus and wine liquid to create a refreshing, yet light salad (or dessert).
. . . hmm. . . . Now that I think about it, this salad would also be lovely on a hot summer day. Bottom line: This salad is good whenever you eat it. And, here’s how I updated it for modern cooks. Peel the oranges using care to remove the white membrane. Pull the orange segments apart into two halves, and then pull them apart again so there are quarters. Slice the quarters into pieces about 1/3 inch thick. Put the orange pieces in a bowl, and gently stir in the powdered sugar and mint. In a small bowl combine the wine, lemon juice, and orange juice (and, if desired, the maraschino cherry juice). Pour the liquid over the orange and mint mixture. Serve in champagne (or other decorative) glasses. Garnish with maraschino cherries and mint sprigs. I only used half as many oranges as were called for in the old recipe. I also halved the amount of mint that I used. I did use the full amount of the other ingredients so that I would have plenty of liquid to pour over the orange pieces. I also added a little maraschino cherry juice to the liquid to give it a lovely pink hue. And, I skipped the angelica because it’s not easy to find these days. Angelica is the dark green candied fruit that was frequently used in fruit cakes in days gone by. Posted on February 12, 2017 February 12, 2017 by SherylPosted in FoodTagged mint, oranges, recipe, salad. This sounds rather modern in many ways, apart from the maraschino cherries which remind me of my 1950s childhood. I wouldn’t know where to start looking for those (Actually, I’ve just Googled them. They are available after all) However, I could source the angelica without too much trouble, and I think the zip of colour they offer would be a nice contrast. These kinds of difference are what makes life interesting, eh? I’ve never heard of angelica. I use citron in my holiday baking, and green cherries, but I’m not sure I’ve even seen angelica. In any event, this is the way I eat my oranges anyway — peeled and cut into sections — so it would be easy enough to complete the steps and give this a try. I’ve never thought of combining orange and mint, but I like both, so why not? It’s amazing that we both posted recipes that used mint this week; and that we both suggested that the recipes provided a hint of spring. I guess great minds think alike. 🙂 I actually made the recipe and wrote this post a couple weeks ago, but now wish that I still had some of the mint that I bought to make it, so that I could try your recipe. I may have to buy some more. Is that red or white wine you added? Looks refreshingly delicious for any day! White . . . but either would work. This looks so good! Definitely a must try! It’s a nice, refreshing fruit salad. I only tried white, but either should work. This would make a very attractive dish for adding appeal to your table! I like how the original recipe directions indicated that the salad should be put in champagne glasses. It really makes it look special. If there hadn’t been serving directions, I would have just put it in a bowl. Oranges were probably more expensive back then than what they are now, and perhaps the serving suggestion provides an indication of how special they were. I agree- This would be a wonderful fruit salad any time during the year. Such a pretty dish. The balance of colour is perfect. I was happy with how nicely it turned out. It is a very aesthetically pleasing dish. It does look refreshing. I find that it gets so dry in the house in winter due to the heaters and lack of humidity in the air that it’s nice to have refreshing things to snack on. Sounds very good and a different change for a salad. My mint plant froze, so I’ll have to wait for the new plant to produce enough leaves to harvest! Love the happy finish look! It’s nice to hear that you liked the presentation. I was pleased with how it turned out. It’s wonderful to hear that I posted this recipe at just the right time for you and my other Australian blogging friends. Just add a little shredded coconut and this definitely would be an ambrosia salad. That does sound like a refreshing summer salad! What’s Angelica? Lol. I will google. Love the simplicity of this salad. Looks delicious. Did you find what Angelica is? If case you didn’t, I can tell you what it is. Angelica is a dark green candied fruit that was popular in the early 1900s. “a tall aromatic plant of the parsley family, with large leaves and yellowish-green flowers. Native to both Eurasia and North America, it is used in cooking and herbal medicine. the candied stalk of the angelica plant.” So interesting. See? You really can learn something new everyday. Lol. Lovely presentation! It looks so refreshing, I would love to taste it! Thank you! It’s nice to hear that you liked the presentation. It is a delightful salad.